f the Marker Advisory Committee declines to approve a subject for a state historical marker, it may be an appropriate topic for a local or private marker. 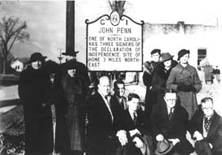 Several counties, cities, and historical groups have in place local historical marker programs for marking places of local and regional significance. Individuals or groups are free to pursue the purchase of privately funded markers or plaques. A list of manufacturers, with addresses and phone numbers, is provided below. Such markers must be placed on private property outside the highway right-of-way, cannot bear the Great Seal of North Carolina, and should differ from state signs in color. They are not considered part of the official state marker program. The Office of Archives and History as an agent of the State of North Carolina is prohibited from recommending any particular private supplier. The following companies have sent us material indicating that they manufacture historical markers or plaques. We suggest that interested parties correspond directly with companies listed. The State of North Carolina is not in a position to comment on the quality or reliability of service of these firms.